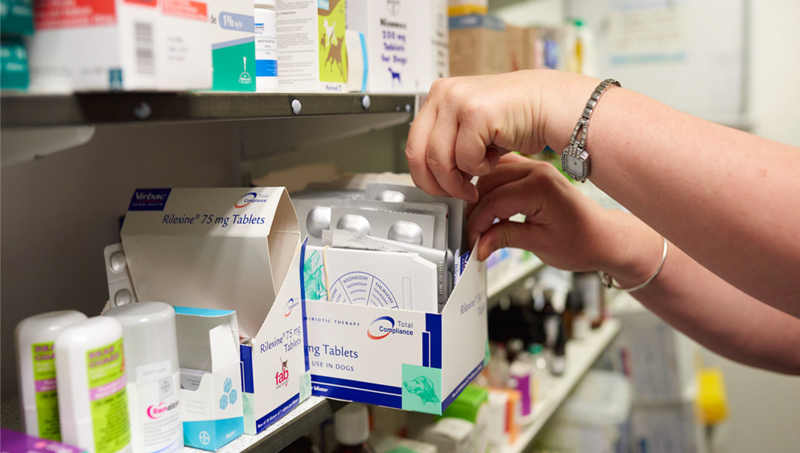 We are able to supply clients with medicines direct from our pharmacy. Those which are on general sale over the counter (like those generally available from pet shops). Medicines can only be prescribed for an animal that is under our vets’ care and attention. This requires physically seeing the animal and at regular intervals throughout their treatment. The veterinary regulations guide is for re-examinations to occur every 3 months for "normal" treatments. The vet may authorise Repeat Prescriptions until the next scheduled examination. Where possible we have reduced the price of medicines used for long term conditions as much as possible. Please provide us with a minimum of 48 hours notice to enable us to prepare repeat prescription medicines for your collection from our Veterinary Hospital or Branches, or they can be delivered by Special Delivery. Repeat Prescriptions and Non Prescription Medicines can be ordered on-line by Registered clients of the Practice only. By ordering online you are agreeing to the cost of those medicines, which will be added to your account. Medicines cannot normally be returned to the Practice either part used or unused. All vets can provide a written prescription for you to obtain your prescription medicines elsewhere; a £12 charge is made for each prescription, and again we will require to see you pet, horse or livestock at intervals stated by our vet. If purchasing medicines off the internet please ensure you are absolutely 100% confident of the origin of the medication and that they are the real medication prescribed by your vet and not an untested and unregulated "copy" which could be very harmful.